Since 2004 the Ian Daly Swim A Mile with a Smile has been organised by Laura & Brian Daly from Celbridge, in memory of their son Ian who died from cancer in 2003, age 11. The swim aims to be a fun, family orientated event where swimmers of all abilities can take part, have some fun and along the way, help out the two charities supported by the event, Barretstown and Our Lady’s Children’s Hospital, Crumlin. To date (2017), swimmers have raised €520,000 in sponsorship which is divided equally between the two charities. The swim centres on the National Aquatic Centre in Dublin where for two days annually, over 300 swimmers come to swim their mile, either solo or as part of a group, in relay. We’ve had swimmers aged from 5 to 80 take part in what is a great day each year. Swimmers who cannot make it to the NAC can complete their swim an their local pool whether a public pool or in a local hotel or sports centre. We can contact them and organise this for you as needed, just let us know. We have had wonderful support throughout the years from Éamonn Coughlan, Paul McGrath, The National Aquatic Centre, Dublin GAA, Jim Gavin, U2, Swim Ireland, Colin Farrell and others who have helped raise awareness of the swim. Our wonderful sponsors help cover the cost of running the event so that all sponsorship monies raised by the swimmers go directly to the charities. A growing number of schools are including the swim as part of their TY program and students have enthusiastically embraced the dual challenge of the swim and raising sponsorship. 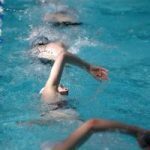 We can visit your school and give a talk to the teachers and students about the swim, the charities it supports and then arrange complimentary swim time for the students to complete the challenge. Please contact us for more details. If you, your friends, your swim club, your work colleagues or school would like to take part, please contact us. We can provide you with all the material you need to organise and run your sponsored event, whether it is for one or one hundred participants!